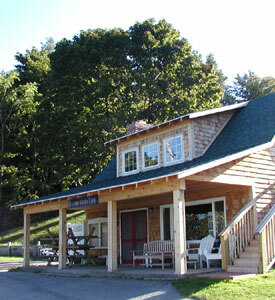 The club is located at the end of Pearl St. in Leland, a short walk or drive from the center of town. Some parking is available. Start from the Post Office at the corner of Main St. and Pearl. Go up hill on Pearl St, past the school, towards the Leland Lodge. Continue past the Lodge, down hill on Pearl St, to Bartholomew Park (Nedow's Bay). You will see a wooden Leland Yacht Club sign. Continue past that sign for another 100 feet. You're there!